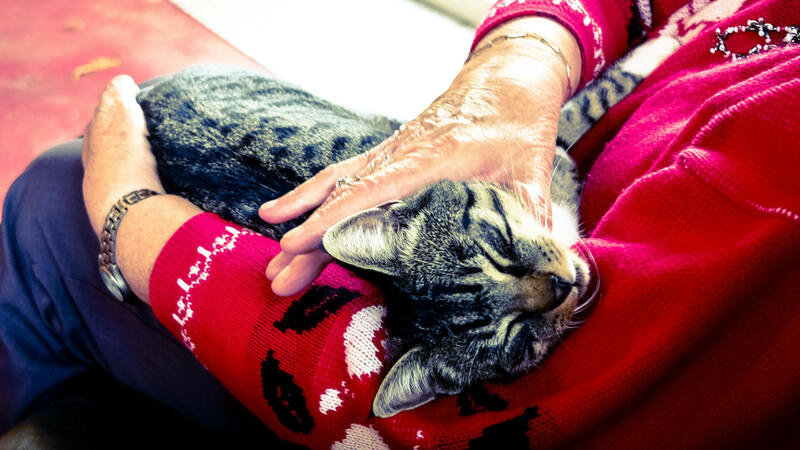 Whether you’re getting your first or your fifteenth cat, chances are you already know you’re in for a special bond with your new family member. You’ve made the decision to get a cat, you might know which cat you’re getting, and you may even have a name picked out. There are some very important things you’ll want to do before you even bring your new cat home. You will be taking your cat to the vet a lot for check-ups. 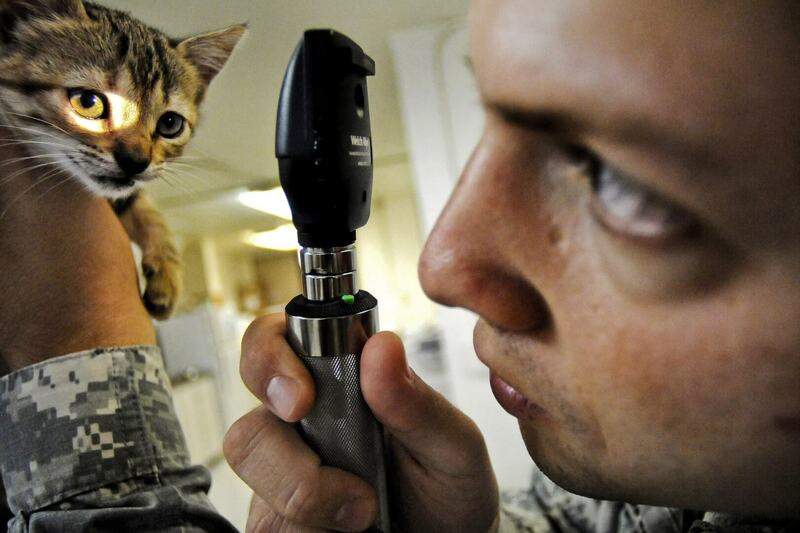 There may even be an emergency situation when your cat needs to see a professional. Most likely, you’ll need to bring your cat to the vet right away for things like initial shots and fixing. It’s a good idea to do some research on which vets in your area are close by and highly rated. Go in and set yourself up as a client once you’ve chosen a vet so you can bring your cat in right away. While initially expensive, purchasing the following things are a good idea when preparing to bring home a new cat. There are many choices when it comes to these supplies. If you’re unsure of what to get, check with your cat’s breeder or shelter and your vet for suggestions. Save 20% off Select Grumpy Cat Toys & Beds at PetSmart.com! Your cat is going to feel scared and uncomfortable when it first gets home. The best thing to do is to set up a room where it can spend its time until it gets more comfortable. Get this room set up with all the supplies you’ve bought, including the food and water bowls and the litter box. Make sure there’s a place your cat can hide in if it wants to. If you bring the cat home in a carrier, this doubles as a good hiding place. Just like bringing home a baby, you’ll want to kitty proof the house while your cat gets used to its new surroundings. Look for hazards like dangling cords or hazardous chemicals. Make sure you are able to shut doors to any areas of the house you don’t want the cat to go. It’s also a good idea to double check that all your doors and windows are lockable. Practice closing and securing these when you’re not in the room. Don’t be discouraged if your cat seems uncomfortable or nervous during this stage. Do your best to make the cat comfortable and allow it to warm up to you. While you’ll want to be affectionate to your new cat right away, this will more likely than not be very off-putting. Let your cat choose to come to you, but do partake in positive reinforcement. Play with a toy and encourage your cat to come play with you. Follow the cat’s cues on whether it’s enjoying the play or not. Sit by the food bowls while your cat is eating. Try sitting further away at first and slowly moving closer, again paying attention to signs of aggression or fear from your cat while you do this. Sit in the room and do something “normal” like read a book or play on the computer. 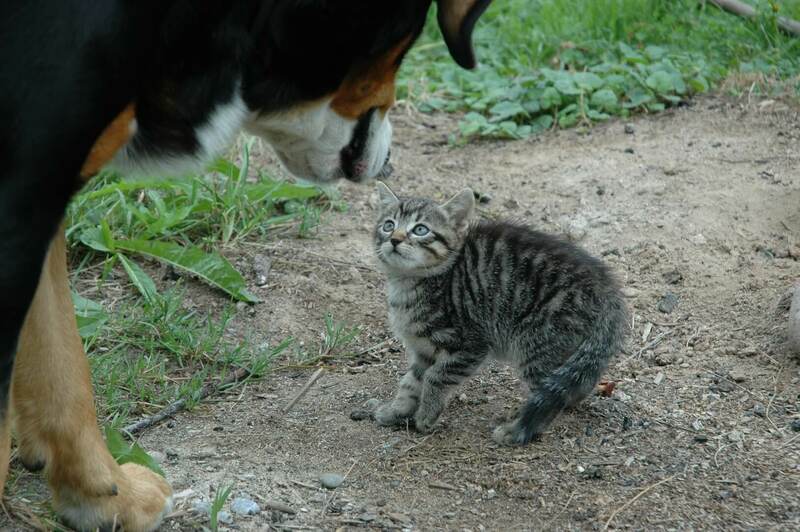 Don’t react when the cat comes up to check you out. Sudden movements may scare it away. Your cat is going to be confused, nervous, and possibly upset for a little while. Throwing other pets into the mix could cause even higher stress levels. It’s not a good idea to let your pets and your new cat work things out on their own. Try to keep them separate for the first four to five days. Even if they can’t see each other, they will be able to hear and smell each other. Associate the presence of your pets with positive reinforcement. For example, try feeding your cat and your other pet on either side of the closed door so they can sense each other while they’re eating. After your cat gets more comfortable, put something that has the scent from your other pet in the same room so they can interact with the object. Before introducing your pets face to face, allow your new cat time to explore the house while your other pets are shut up in a room. Again, do this slowly, letting your cat have more and more access each time you let them out. When you feel both pets are ready, supervise the initial interaction. Break up any fights that may occur. You can do this by clapping your hands loudly or throwing something soft in their direction (but not aiming to hit them, just distract them). If tension doesn’t seem to decrease, seek advice from your vet. It’s natural your cat will be stressed at first and this stress will affect how they act. This can be a tough question for some. There are legitimate reasons for being wary of letting your cat outdoors – wildlife, traffic, and disease for example. Cats do seem to really enjoy the outdoors, however. Here are some possible solutions for letting your cat enjoy the outdoors with less of a risk. Take your cat out on supervised walks with a harness. Allow supervised access to balconies. Build or place perches next to windows that you can open (with a screen in place). Build a cattery or an outdoor enclosure. While it is important to be cautious and observant with your new cat, make sure you enjoy the time you spend with them. This cat will become a really important part of your life. Love them, cherish them, and treat them with your absolute best. You’re in for the best ride of your life!